RBTH presents a selection of views from leading Russian media on international events, featuring reports on a drastic decrease in the number of Russians buying cars, an increase in militant activity in the North Caucasus, and Shell’s interest in joining Gazprom’s Sakhalin-3 project. Russia has dropped out of the world's top 10 largest car markets, writes the Russian business daily Vedomosti, citing the analytical agency Avtostat, which combines statistics from the largest international experts. Over the past year, the purchase of cars by Russians has decreased by almost 37 percent. According to this indicator, Russia is rated 12th, behind several European countries, the U.S., Japan, India and South Korea, says the newspaper. Sergey Litvinenko, the director of PwC Russia’s Automotive Advisory practice, told Vedomosti that the change in the balance of power was caused by Russia's weak results over the last year. 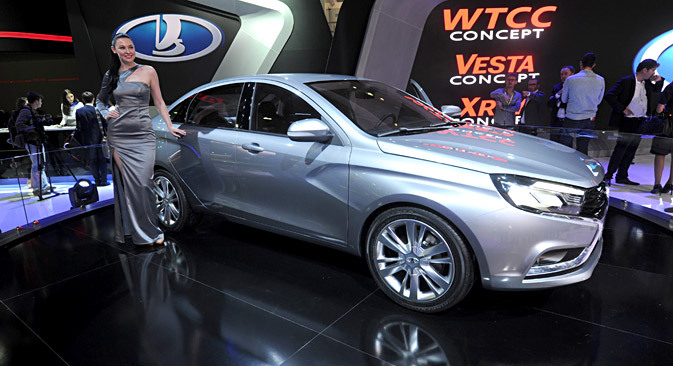 However, he believes that car sales will go up as early as in 2016, both due to the low base effect (an extremely low starting position) and the release of AvtoVAZ's new model, the Vesta. According to a survey by the Association of Russian Car Dealers, 35 percent of dealers believe that car sales will begin to recover in 2016, 26 percent expect a market recovery in 2017, but most of them (39 percent) anticipate the restoration of sales growth only after 2017, Vedomosti writes. According to Avtostat's director Sergei Tselikov, significant growth of the market should not be expected in the next two years. “Low oil prices, the devalued ruble, high interest rates and sanctions by the world's leading countries do not give hope for a quick recovery of not only the car market, but the other consumer segments as well,” he said. Clashes between security forces and armed gangs have grown more frequent in the North Caucasus, the centrist daily Nezavisimaya Gazeta reports. Eight militants who had recently joined the Islamic State (ISIS) radical group, were eliminated in the Ingush village of Dattyh on Aug. 1. Islamic State has been banned in Russia. According to the Russian National Anti-Terrorist Committee, they included Adam Tagilov, the organizer of a terrorist attack in Grozny in December 2014 that left 10 policemen dead, the newspaper reports. On July 23, a gang that had planned the assassinations of government officials during the celebrations on the Day of the Republic was destroyed in the capital of Kabardino-Balkaria, Nalchik, adds Nezavisimaya Gazeta. Alexei Malashenko, a member of the Scientific Council of the Moscow Carnegie Center, told the newspaper that the intensification of militant activity in the North Caucasus might be indirectly related to the influence of ISIS, which had been joined by the local terrorist group Caucasus Emirate. The expert also noted that the level of terrorist threat in Kabardino-Balkaria is now comparable to the regions of the eastern Caucasus – Dagestan, Ingushetia and Chechnya – that are traditionally characterized by the activity of militants. At the same time, fighting in Nalchik and Ingushetia, in his opinion, could lead to the intensification of activities by the Islamists, writes Nezavisimaya Gazeta. Valery Khomyakov, general director of the National Strategy Council, told the newspaper that the increased activity of armed groups could have also been influenced by the seasonal factor. “As a rule, gangs are always more active in summer: The greenery helps [them] to hide, to escape from pursuit,” he said. The Russian business daily Kommersant writes that the Anglo-Dutch company Shell wants to participate in Gazprom's Sakhalin-3 gas project. This project is intended to provide a resource base for the new stage of the LNG plant belonging to the partners’ other project, Sakhalin-2. The decision to join the project has been made by the company under agreements with Gazprom on the exchange of assets, writes the newspaper. Sakhalin-3 includes the development of four offshore blocks in the Sea of Okhotsk – Kirinsky, Veninsky, Ayashsky and Vostochno-Odoptinsky. The Kirinsky block comprises the Kirinskoye, Yuzhno-Kirinskoye and Mynginskoye oil and condensate fields discovered by Gazprom. It is planned to produce about 5.5 billion cubic meters of gas there by 2018, says Kommersant. Vitaly Kryukov, the head of the Small Letters service of independent analysis, explained in his commentary to the newspaper that Shell is interested in Sakhalin-3 due to its proximity to Asian markets, while the entrance of the partner will help Gazprom to receive access to additional financing, technology and market as well as to share the risks. According to him, Gazprom is likely to get a share in one of Shell’s LNG projects in exchange, Kommersant writes.